On Switched at Birth Season 5 Episode 10, five years after the switch was discovered Kathryn uncovers a long-buried family secret in the series finale. 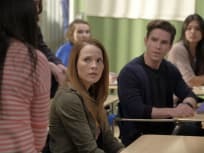 On Switched at Birth Season 5 Episode 9, Daphne considers helping Chris cheat on a test, while Travis and Bay's dinner with his birth mom doesn't go as planned. 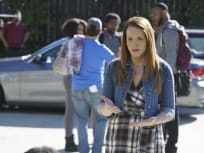 On Switched at Birth Season 5 Episode 8, Bay’s high school frenemy Simone ignites insecurities, while Daphne and Chris get to know each other better. On Switched at Birth Season 5 Episode 7, after meeting a mysterious woman, Bay and Daphne are both experience a flood memories of their late father. On Switched at Birth Season 5 Episode 6, Bay believes her work is being plagarized, while Daphne worries her medical mentor makes mistakes with his patients. 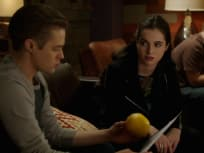 On Switched at Birth Season 5 Episode 5, Iris continues her hunger strike, while Chris is torn between his future in baseball and wanting to show solidarity. 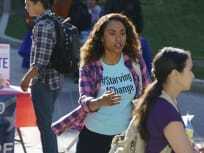 "Relation of Lines and Colors"
On Switched at Birth Season 5 Episode 4, Daphne receives an anonymous threat after witnessing a racist display aimed at the Black Student Union on campus. On Switched at Birth Season 5 Episode 3, Toby and Lily return from London prepared to get married but have a fight before the big day, while Bay runs into Tank. 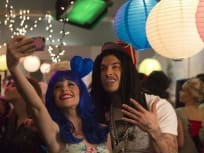 "This Has To Do With Me"
On Switched at Birth Season 5 Episode 2, Daphne and Mingo end up in the middle of a controvery after photos of them in their costumes go viral. On Switched at Birth Season 5 Episode 1, while in China, Daphne and Bay receive an emergency phone call and return home on the season premiere.